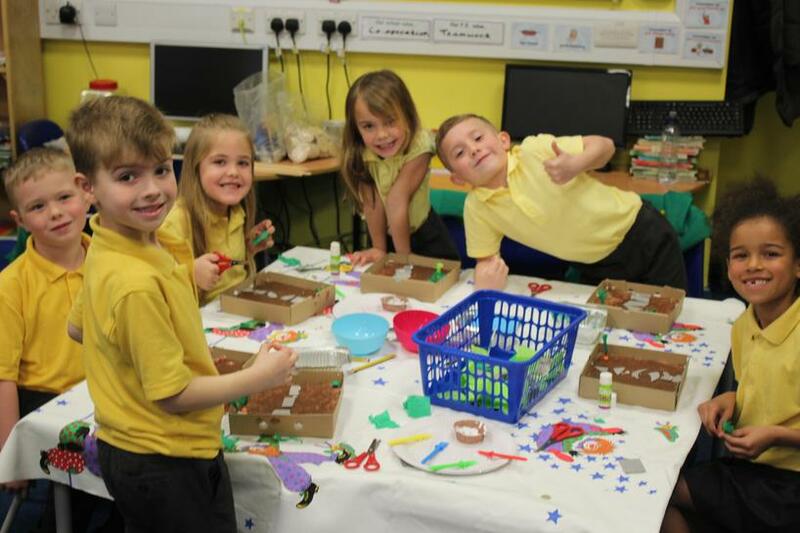 As we have reached the end of the Spring term, may we take this opportunity to kindly thank all parents and guardians for your support once again this term; you have kindly sent in hardboiled eggs, boxes, Wellington boots, charitable donations and a whole array of fantastic homework creations (and so many other things!). 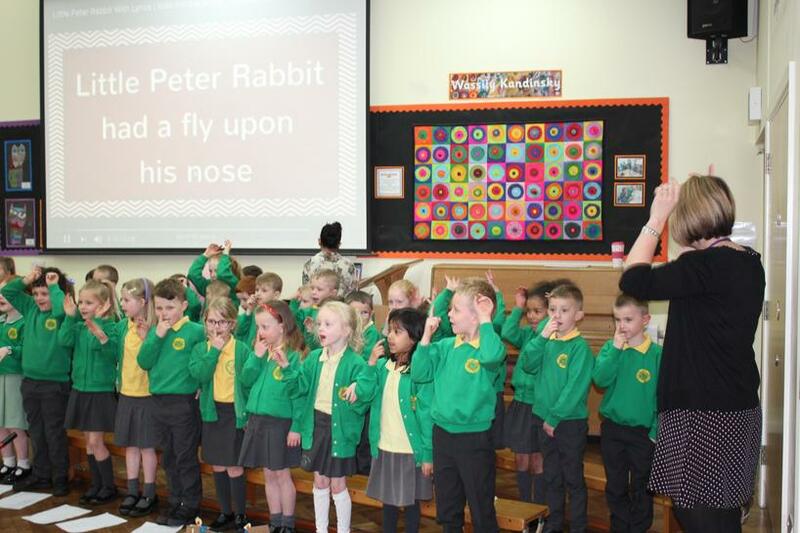 We thoroughly enjoyed learning about the Tale of Peter Rabbit by Beatrix Potter this term and this culminated in our performance on Thursday morning - thank you once again for being such a wonderful audience. To echo the sentiments shared on Thursday morning, thank you once again for all your support this term and have a lovely, safe and restful Easter holidays. We will see you all bright-eyed and bushy-tailed (in true Peter Rabbit fashion) on Tuesday 23rd April. 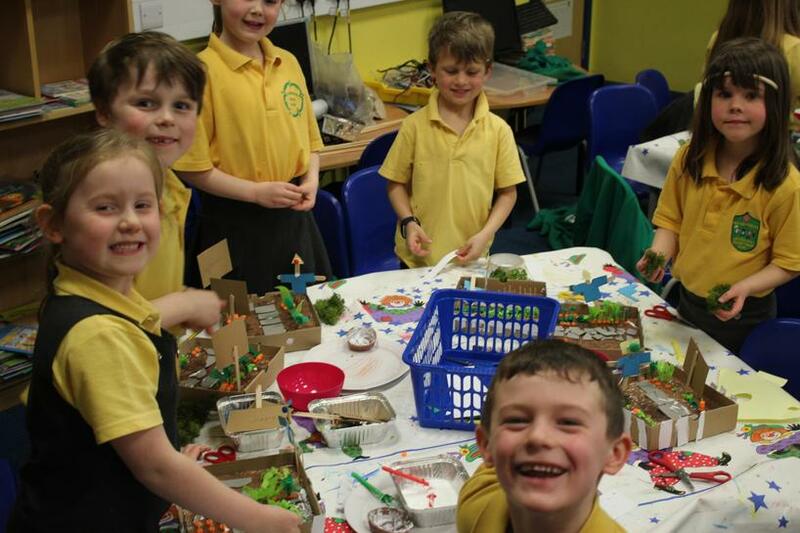 Continuing with our Peter Rabbit topic, Year 1 were very fortunate to have a wonderful local artist come and visit their classes and help them create a real life version of Mr McGregor's garden . 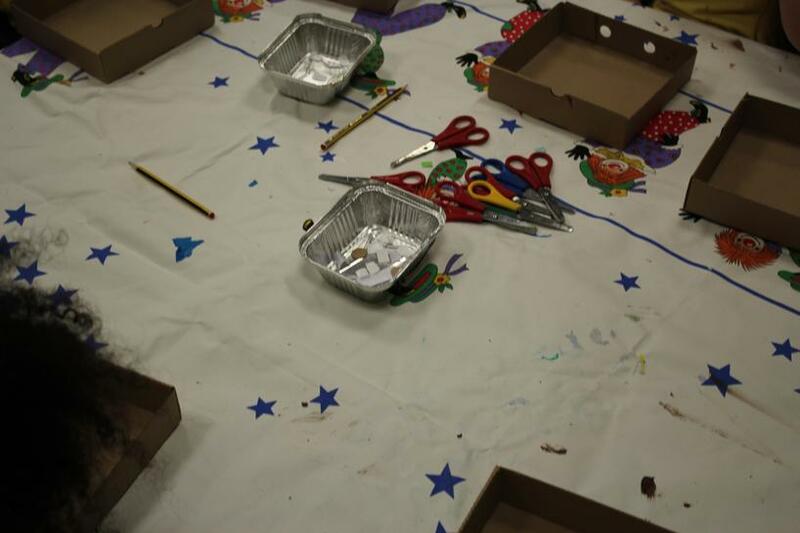 With the help of the excellent Sarah Hicks, both classes painted, chopped, stuck, drew, cut, prodded and poked their way to their own individual masterpieces. Meanwhile, here's some of the 'action' from this week. 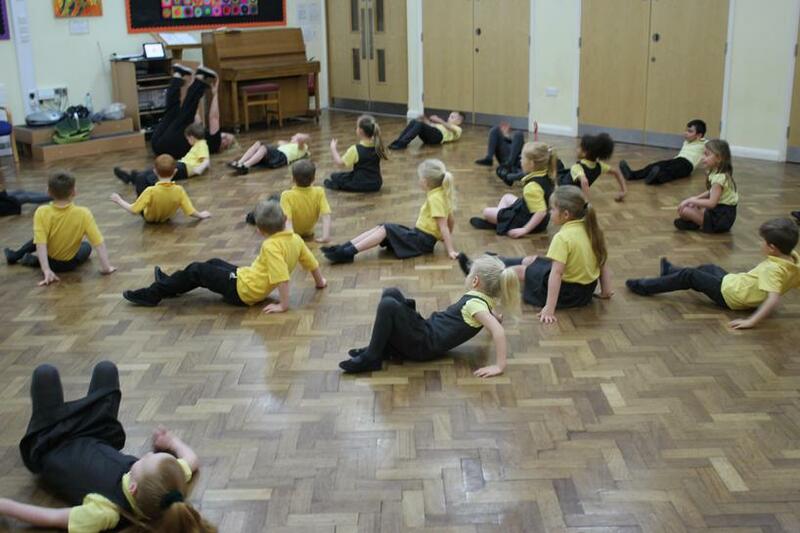 The first exciting activity of our 'Creative Arts Week' started with both Year 1 classes engaging with a drama and dance class on Monday morning. 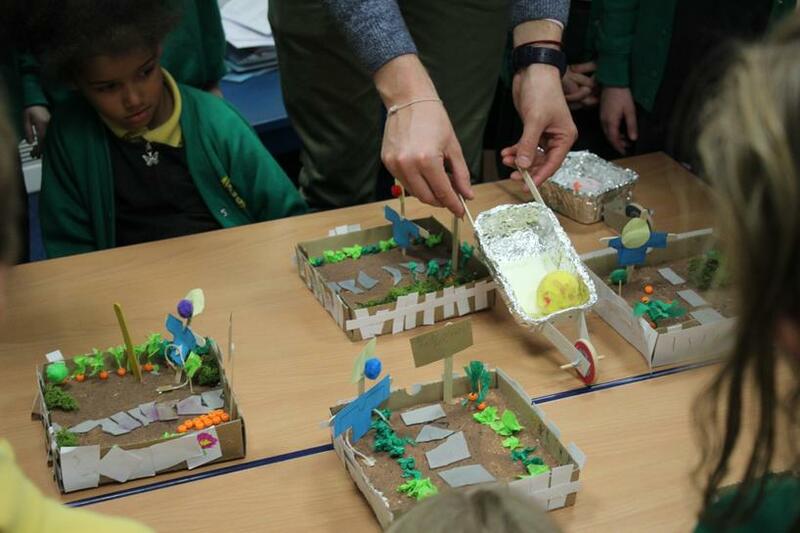 Using games and activities, accompanied by music, our specialist coach brought our class text - Peter Rabbit - to life. The children loved escaping Mr McGregor's garden. 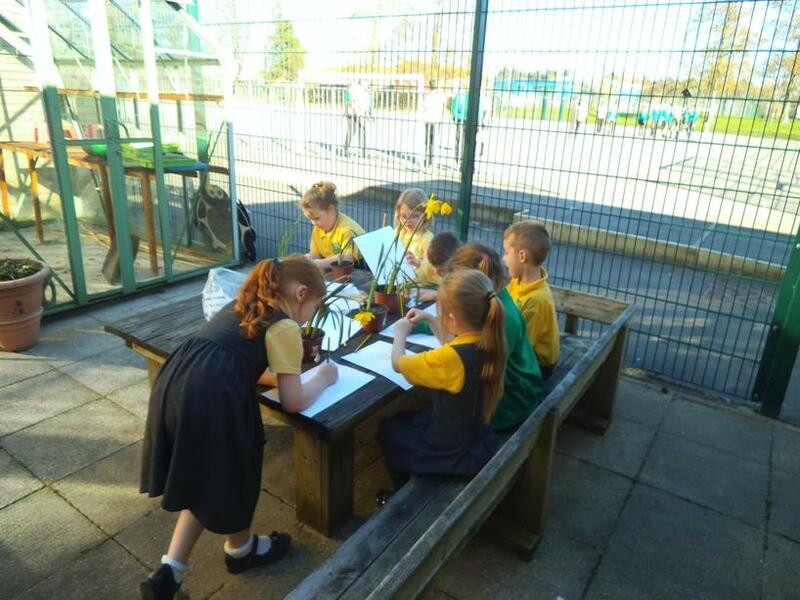 We have been looking for signs of Spring in our school area. 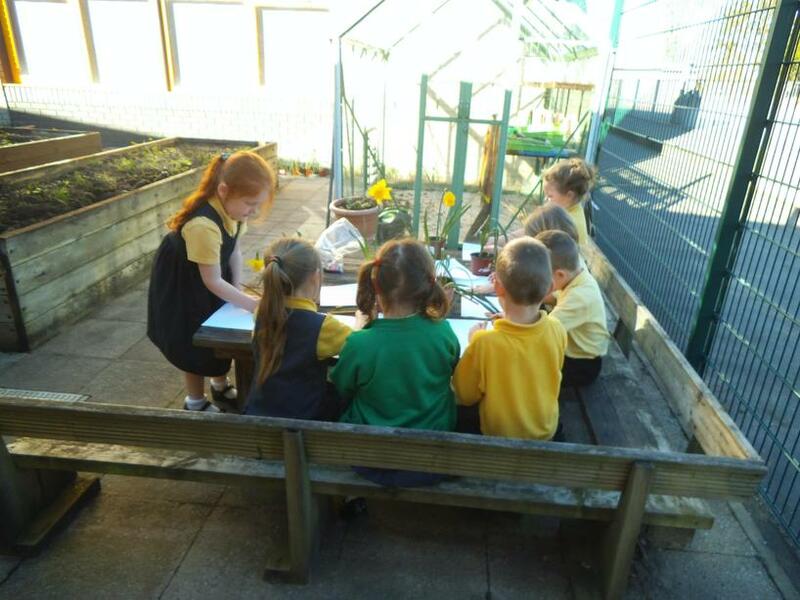 When we went outside we saw lots of lovely daffodils which we had grown ourselves. 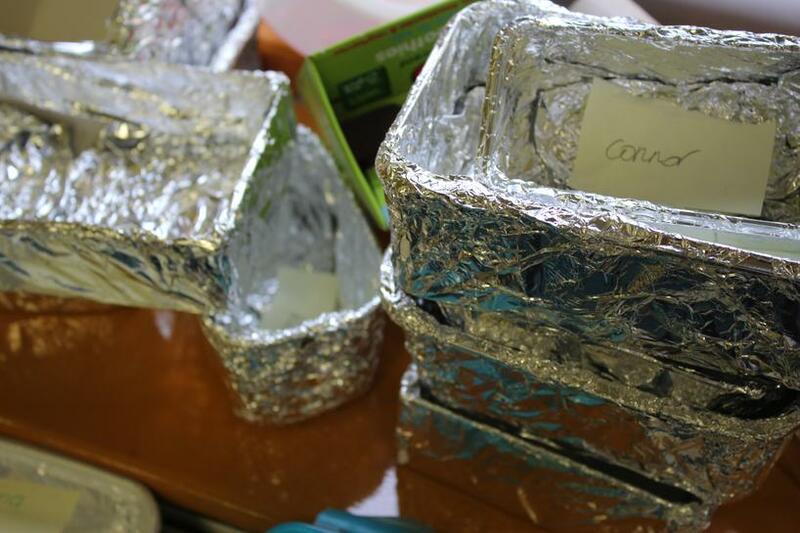 Last Autumn we planted bulbs in pots of soil. The sun, light. rain and warmer weather has helped them to grow. Not all of our daffodils are the same. Some have big flowers and some have yellow buds that haven't opened yet. Year 1 have been busy all week learning about what worship means to Buddhists. 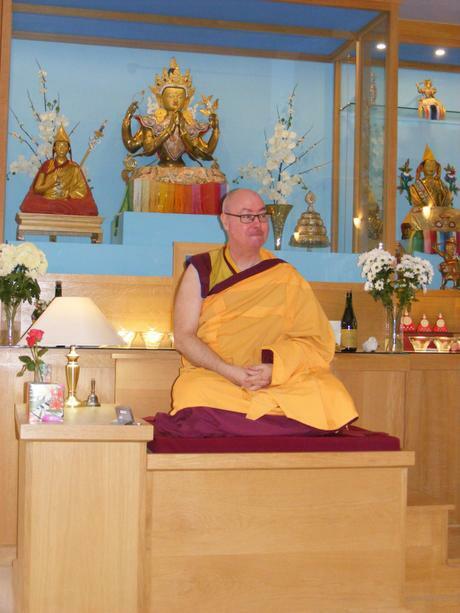 We have carried on practicing our meditation and this has helped us to make the most of our busy week. In our English work we have been using adjectives to describe some of the giant leaves left by Jack after he climbed the magic beanstalk. The giants friend phoned our class to see if we could describe the giant on a 'Wanted' poster. smooth green holey grumpy nasty hairy. Can you guess which adjectives were used to describe the giant? 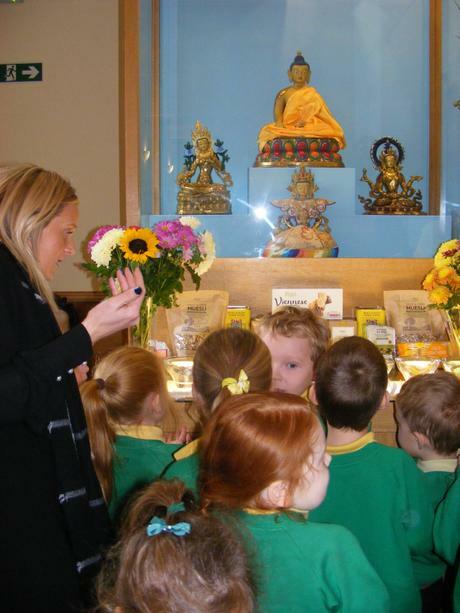 Year 1 Visit To a Buddhist Temple. 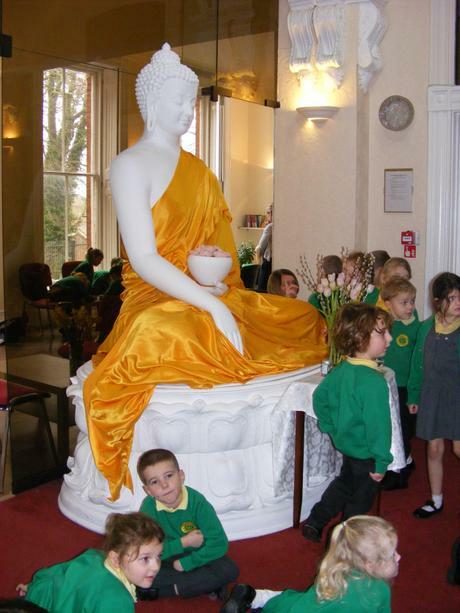 As part of our RE topic on Buddhism we went on a bus to visit a Buddhist Temple in Preston. The monk chanted to us and helped us to meditate. We felt very calm. There were lots of statues of the Buddha and temple offerings. We made our own offering of Lotus flowers to place on the shrine. 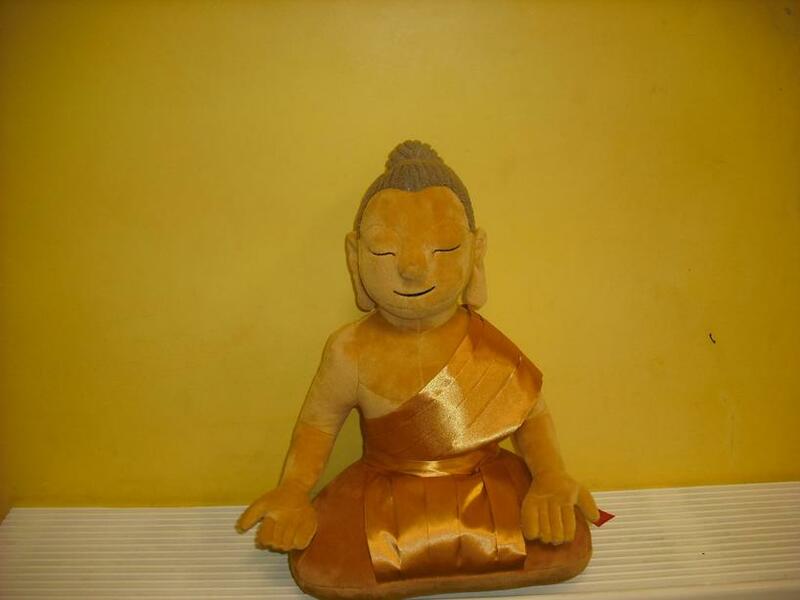 We looked at Buddha statues. We looked at a huge statue of Buddha dressed in Orange robes. Afterwards we made our own observational drawings. 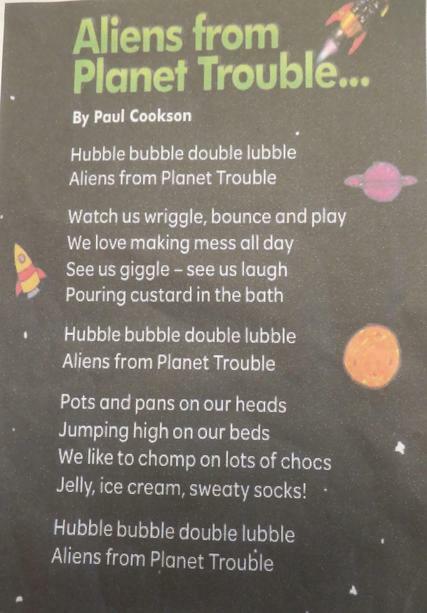 Hubble Bubble Double Lubble Year 1 Are Out Of Trouble! 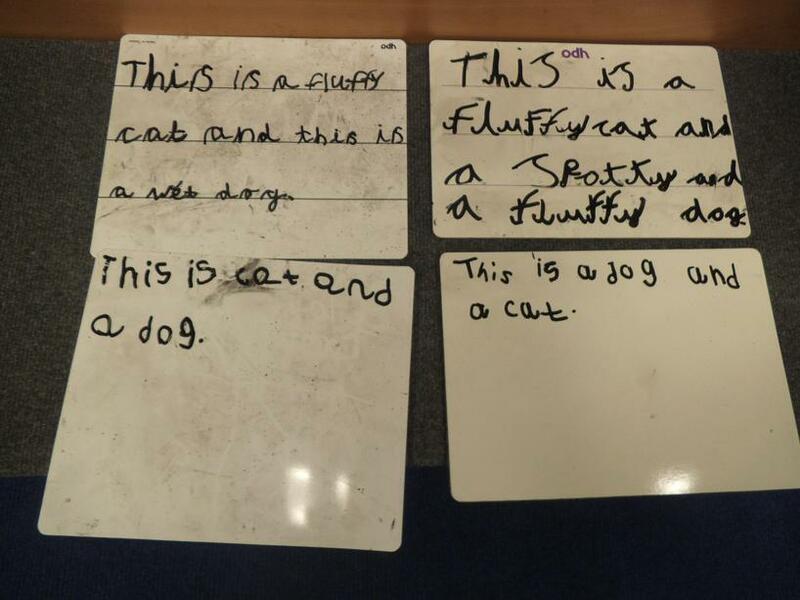 Year 1 have had trouble learning some of the tricky lines from their class poems. 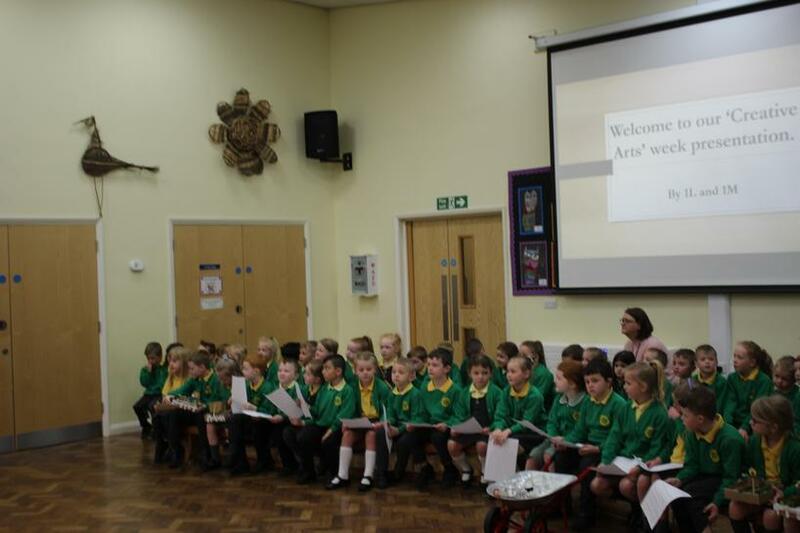 However we have given it lots of practice and we now feel ready to perform to the rest of the school and parents on Monday. 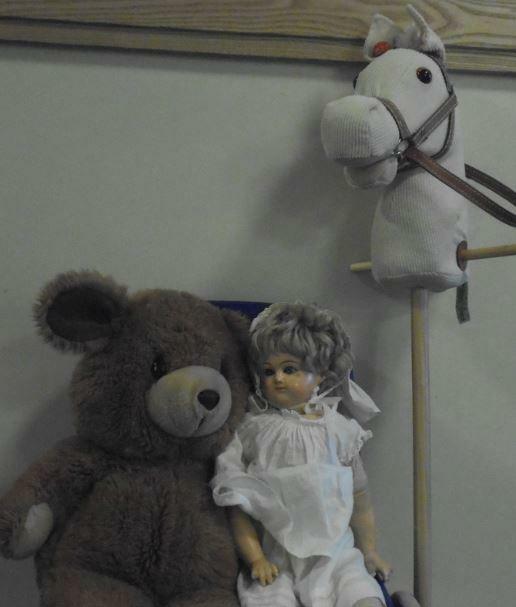 Year 1 have looked at toys (some of them very old toys) and used them to make up their own versions of familiar poems. We have had lots of fun and even included some actions to go with our poems. We have looked at some of our favourite toys. We looked at the materials toys are made from now. We watched a DVD about toys in the past. Year 1 Children saw Santa! Santa made a visit to our Christmas party. 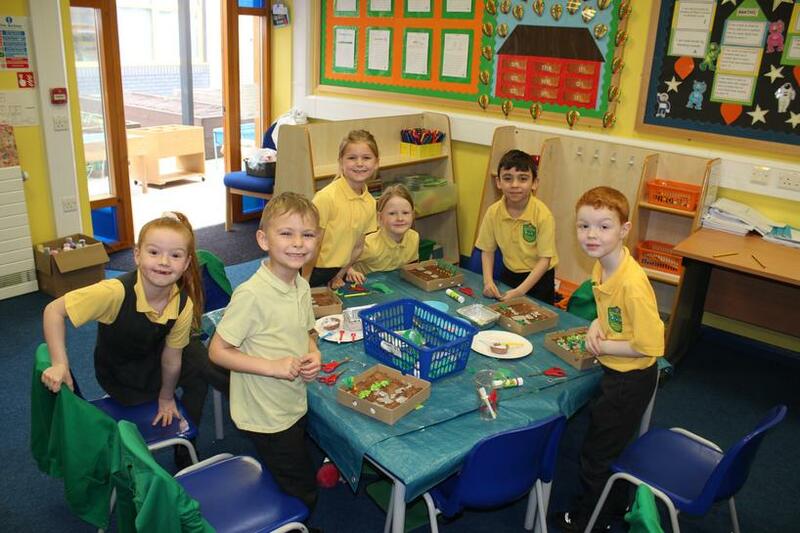 We made Santa decorations from clay and paint. Magical Elves Are Visiting Year 1 The children have been choosing a name for their class elves. They have also been reading stories to him. 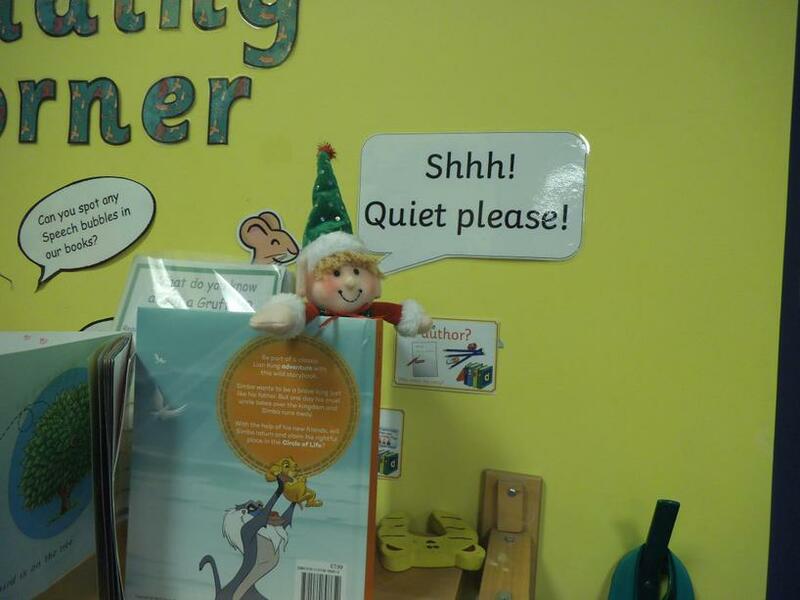 Sparkles the elf loves quiet reading! 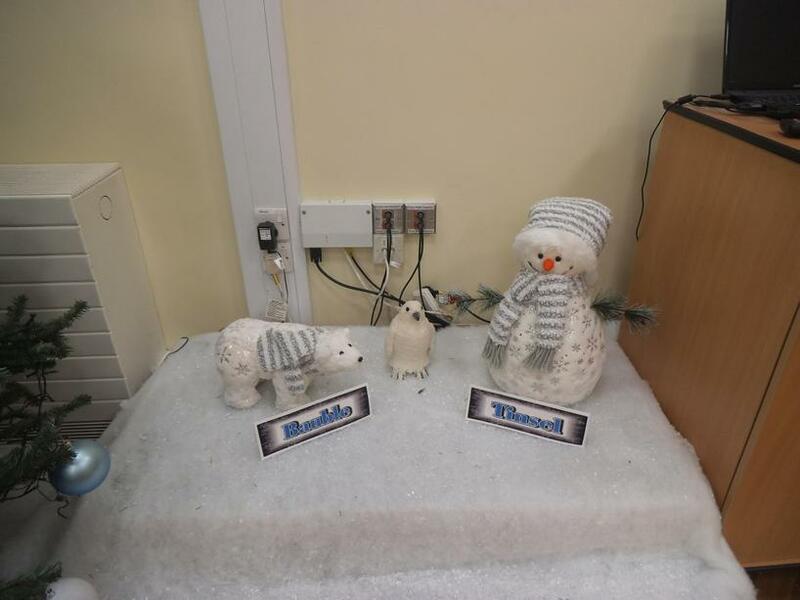 Ho ho ho we have been thinking of adjectives to describe our festive decorations! Ho ho ho we have been enjoying our festive decorations. In our English we have joined words and sentences with the conjunction 'and.' After that we went on to include adjectives. Here are some of our examples. Reading Thermometers We have recorded outdoor temperatures! We gave instructions on how to make a robot move. Dance mats were lots of fun! 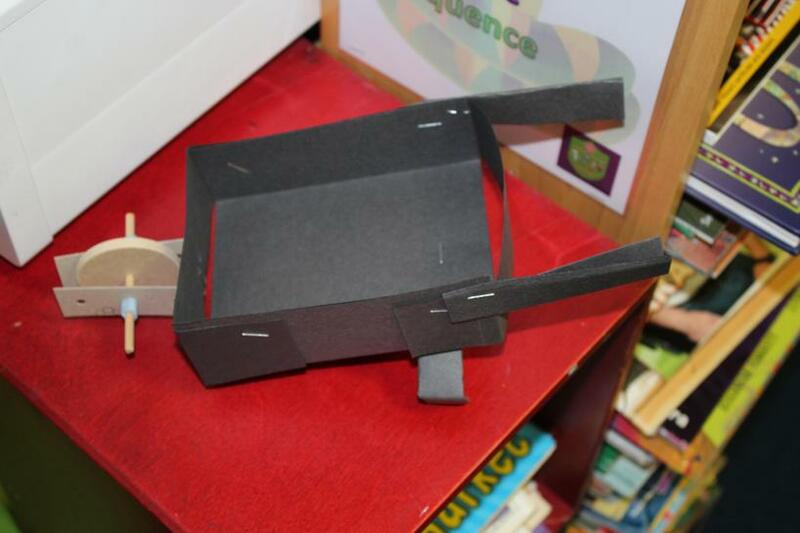 We used 'Reading Eggs' in our I.C.T. suite. Multi Skills Coaching Year one have been working on their throwing and catching skills over the Spring Term. Year 1 P.E. Work. 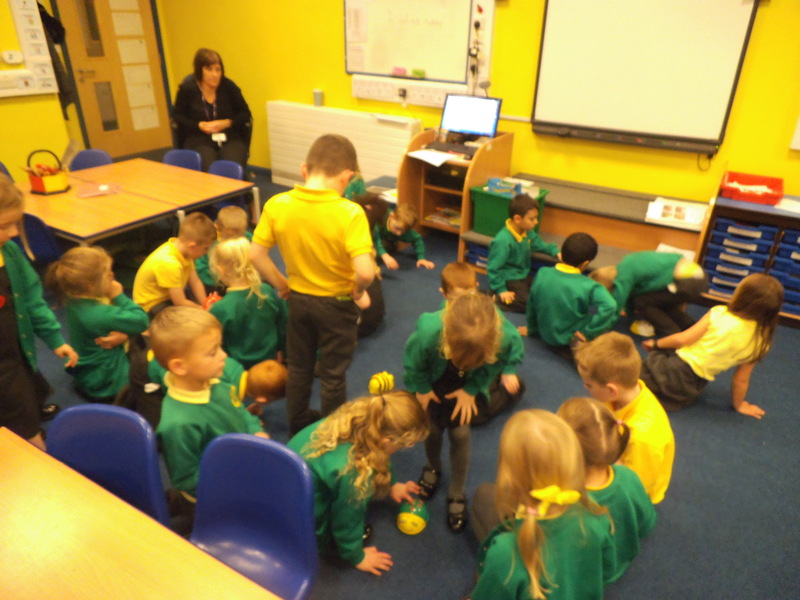 We practiced putting our bodies into a ball shape to see if we could roll. Curing and rolling with our body. Next we stretched and rolled with our body. 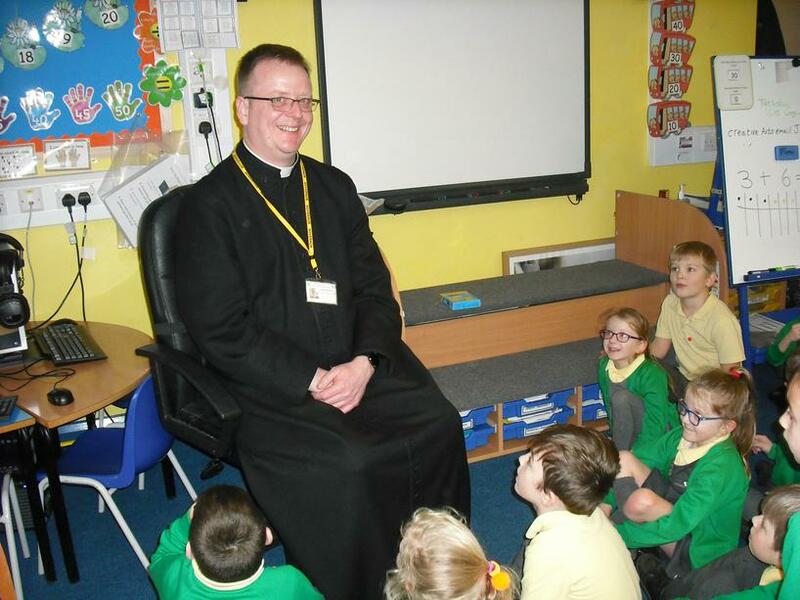 Year 1 have been learning about Buddhism and Christianity. 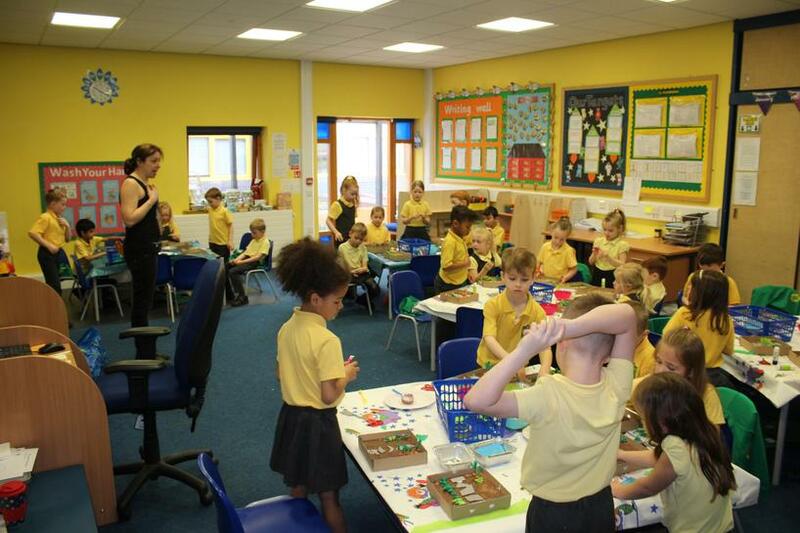 year 1 had a great time at their christmas party playing games such as Musical Corners, statues and Pass The Parcel. A special visitor arrived and gave all the children a present. He told all the teachers that they had been really good and assured Mrs Brownley that he knew where she lived even though she had changed her name. Phew! Year 1 had a visit from one of Santa's helpers. Luckily all the children had been really good and enjoyed reading letters from both Santa and Sparkles one of our Elves. 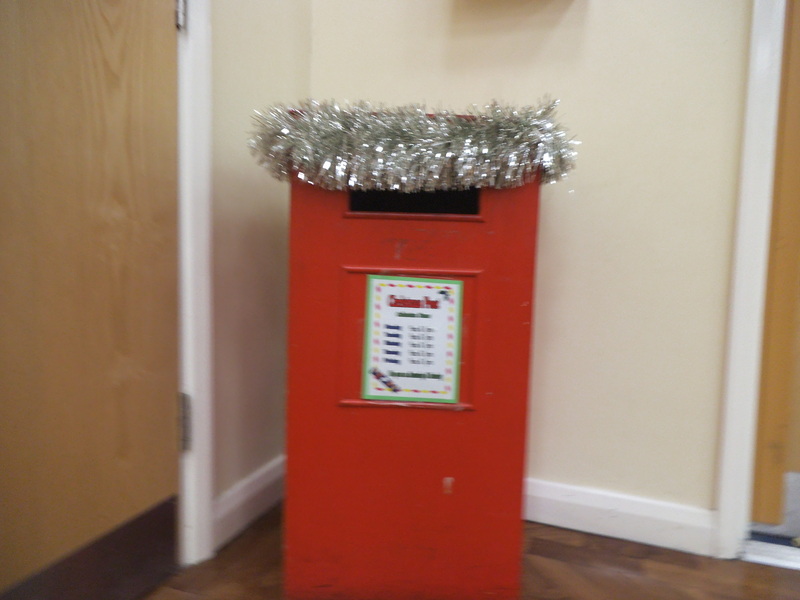 The children learnt how to write letters and wrote letters to Santa and Sparkles. Each morning the children had to spot their Elf and letter in school. Our Elf has now gone back to help Santa and told him that all the children in Year 1 have been great at school. We are hoping for a quick visit from Santa and we have been practising some lovely songs to sing for him. 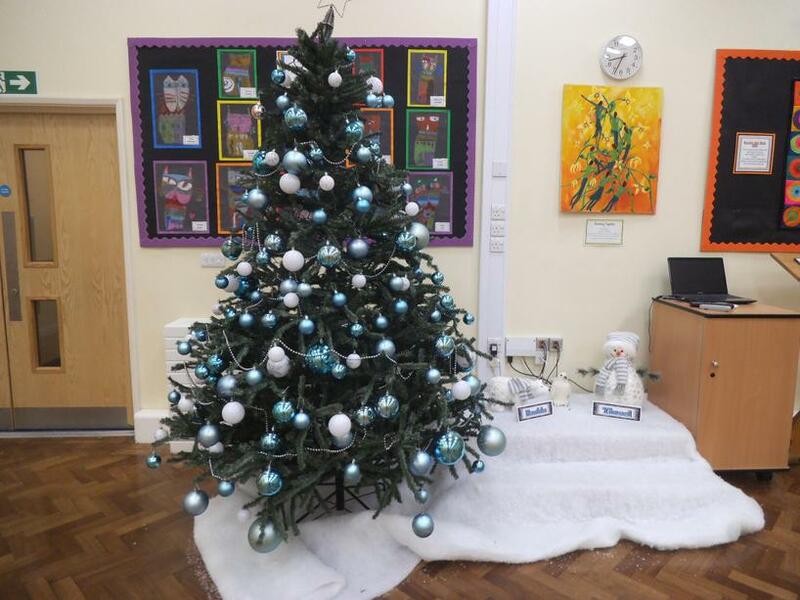 Sparkles the year 1 Elf visited Year 1 Children. He made friends with a snowman. Then he had a ride on a polar bear. He played hide and seek with a Dove. Finally he admired our new Christmas Tree. Year 1 have been searching for signs of Autumn in our school grounds. We have spotted squirrels scampering across the grass storing food for winter. Some of the trees have leaves which have turned into yellow, gold and red. The fruit on the apple and pear trees has been harvested. 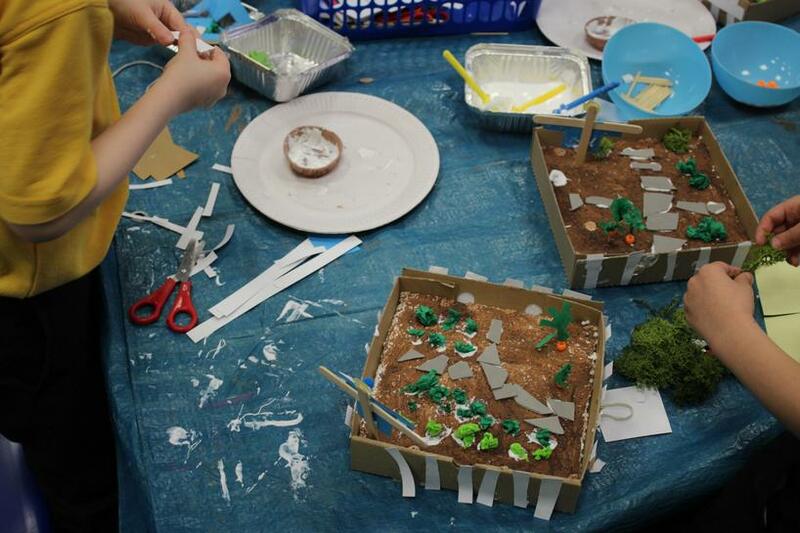 We will continue to look at the changes in our environment and record the changes we see.